Shower pumps are available as twin or single ended, positive head or universal. Shower pumps are ideal for boosting hot and/or cold supplies to thermostatic or manual mixer valves, supplying a wide range of shower types and shower heads, individual taps, cisterns and whole house boosting applications. One of the biggest problems with Shower pumps is incorrect installation. Does your shower pump have a dedicated supply from the hot and cold tanks? This ensures that no air can get into the shower pump and prevents the pump running dry which can cause damage to the propellers. The cold supply should be directly from the cold water tank as far away from the inlet valve as possible. 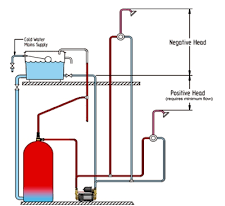 The pump should be sited at the base of the hot water cylinder or within 5 meters. Have you got the right pump? Negative head pumps pull the water as well as pushing the water, these are used for showers that are above the cold water storage tank or shower pumps that need to go into the loft. Get in contact today to book an engineer to come and fix your shower pump, we will investigate any issues and then advise the best course of action going forward. I Have contacted JAS Plumbing on a few occasions and every time Jason has made sure the job is completed even if it has taken him longer then expected. He is polite, friendly and extremely professional. I would have no hesitation in recommending him to anyone. keep it up.